Power Outages: Who Pays the Bill? Work crews repair a section of power lines on Amesbury Rd (Route 110) just North Interstate 495 after the lines were knocked down during a snow storm. If the state’s big power companies have their way, Bay State homeowners and businesses will be slammed with a $160 million record repair bill that comes with big questions about how the region’s utilities responded to massive power outages in the wake of Tropical Storm Irene and a late October snowstorm. The state’s major electric companies have told the New England Center for Investigative Reporting (NECIR) they plan to recoup the cost of restoring power from their customers but have yet to decide exactly how they will do it. The state Department of Public Utilities would determine what the power companies can or can’t do. But there has been only one previous case of the DPU rejecting a utility’s request to pass along the cost of storm repairs, regulators acknowledge. The record bill for last years’s outages– that left hundreds of thousands of home and business owners in the dark across Massachusetts– is just a symptom of potentially deeper problems with the reliability of the state’s electric grid. • A quadrupling of major power outages in Massachusetts over the past five years as major outages, once somewhat rare, have become annual occurrences. • Too few front-line repair crews at the major power companies to avoid prolonged outages after large storms. • Growing concerns over whether the state’s electric grid is being adequately maintained, from aging infrastructure to overgrown trees looming over lines. In a key indicator of potential trouble, the region’s major utilities are understaffed when it comes to having enough linemen and other front-line workers to deal with major storms, the NECIR investigation found. The state’s top three power companies, National Grid, NStar and Western Massachusetts Electric have on average 3 or fewer linemen for every 10,000 people in their service areas. By contrast, the average is closer to four linemen at 11 town and city owned power companies surveyed by NECIR, with some towns employing five or even six linemen for every 10,000 residents. The ability to put more boots on the ground quickly safeguarded town-owned power companies from prolonged outages, industry watchdogs and managers at some of these utilities said. There have been eight major power outages in Massachusetts since 2007, with winter storms being the major culprit, reports filed with the U.S. Department of Energy indicate. All involved the state’s big electric companies. By contrast, there were only two major outages – defined as more than 50,000 homes and businesses losing power – during the previous five-year period, 2001-2006. By contrast, with not enough linemen of their own to respond to big, regional storms, the major power companies were forced to rely heavily during last years’s storms on contract repair crews— some from as far away as the Sunbelt states and Canada. Despite that extra manpower, it took more than a week—in some areas—to restore power. “They (the major power companies) are gambling with the weather and they gambled and they lost,” said Rep. Daniel Winslow, (R-Norfolk), who has proposed legislation that would result in millions in rebates for customers stuck without power for days on end. While acknowledging frustration on the part of customers over the outages, NStar—which serves a large portion of eastern Massachusetts– contends it did a good job getting the lights back on. At the height of “Snowtober” storm, 1.4 million people were without power across New England, federal stats show. But the Massachusetts Municipal Association, which represents communities statewide that bore the brunt of the outages, takes a very different view. “That’s baloney. The end result was a real collapse,” MMA Executive Director Geoff Beckwith said. Last years’s outages were among the worst yet in Massachusetts, rivaling even a brutal December 2008 ice storm and triggering huge costs that eventually could be passed on to rate payers. NStar’s bill for the two fall storms topped $48 million, a company spokesman confirmed. But National Grid’s expenses were double to triple that, ranging as high as $100 million to $120 million, said Deborah Drew, a spokeswoman for the utility. Western Massachusetts Electric’s (WMECO) costs add up to another $23 million, pushing the total for all three companies to at least $160 million and possibly as high as $190 million. The costs for National Grid and WMECO were significantly higher than those incurred in the 2008 ice storm. Bad weather or just corporate bean counting? Outrage over the storm response by the major utilities has sparked a flurry of legislative proposals on Beacon Hill. The Senate this past week passed a bill that would require the major power companies to be more responsive to customers during storms, while also distributing state penalties for poor performance back to ratepayers in the form of credits. The Department of Public Utilities and Attorney General Martha Coakley are both probing how last years’s massive outages were handled. Richard Sullivan, Secretary of the Executive Office of Energy and Environmental Affairs, said state regulators are taking a tough stance with the industry, with more hearings, investigations and financial penalties than ever before. “The level of staffing is absolutely something that is being looked at extremely seriously, as is the maintenance of the system,” Sullivan said. In fact, to match the levels of town and city owned power companies, which largely avoided lengthy outages last year, the big power companies would have to hire hundreds of additional linemen, NECIR’s investigation found. That’s based on an average 3.8 linemen and supervisors, per 10,000 people, at town-owned power companies, including Wellesley, Concord, Belmont, Taunton and Littleton. • National Grid, which has 725 field personnel, would have to hire 336 additional linemen to match levels at the 11 town and city owned power companies reviewed by NECIR. • Western Massachusetts Electric, which has 80 linemen, or a 1.6 ratio per 10,000, would need to hire another 108 linemen. • NStar, with the highest ratio at 3.08 linemen per 10,000 people, would have to hire another 169 field personnel. Even a less hefty increase in the number of linemen would have made a difference in getting the lights back on in Western Massachusetts after last year’s storms, contends Brian Kenney, business manager at IBEW 455 in Springfield, who represents Western Mass Electric workers. But the state’s major electric utilities contend staffing levels are not an issue. Sandra Ahearn, a spokeswoman for Western Massachusetts Electric, told NECIR the company had tried in 2010 to hire eight additional linemen to deal with upcoming retirements but state regulators rejected the request. The DPU did not specifically deny the company’s request to hire linemen, contends Catherine Williams, the department’s spokeswoman. Management decisions on whether to hire staff are not within the department’s jurisdiction. The DPU decision instead prevents the company to use ratepayer money to make the hires. Western Massachusetts Electric could have gone ahead with the hires using other corporate funds and even have requested, in a future rate case, to use ratepayer money to recoup those costs, she said. But having another eight or even 40 linemen wouldn’t have made a difference given the size of the October storm, Ahearn countered. Instead, utility company executives argue they are able to scale up quickly when big storms hit by relying on help from power companies in neighboring states and bringing in outside contractors. That helps get the job done while avoiding the cost of paying for dozens of additional full-time linemen, which would then be passed on to customers, the utility companies say. The major utilities acknowledge that they were forced to bring in hundreds of outside contractors after the two big storms – in some cases, far outnumbering the linemen crews on staff. Western Massachusetts Electric told NECIR it brought in 470 additional crews during the October storm, ten times the 40 crews on staff. 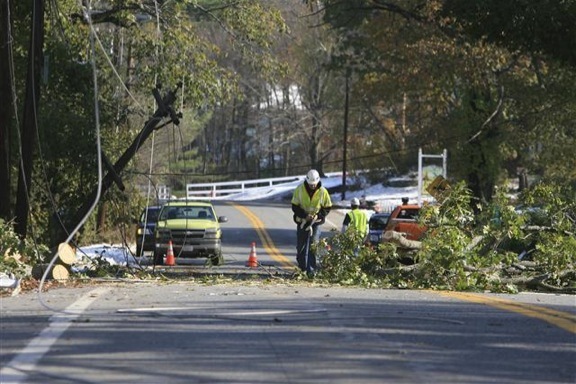 National Grid said it brought 2,800 outside crew members to deal with the October snowstorm. NStar says it is now cross training workers in other departments or specialties, such as gas workers and underground linemen who work in urban areas, to pitch in during a major outage. Still, for the big power companies, a heavy reliance on contract repair crews may be one factor behind the big repair. Contractors can be more expensive, with the utility companies on the hook for hotels and travel expenses, said William Bottiggi, general manager of the Braintree Electric Light Department and a former NStar executive. Whether the contract crew hails from New Hampshire or Colorado, the time clock starts kicking when they hit the road, with workers paid double time during their waking hours and straight time as they sleep. “Once they start traveling they are on the clock and they stay on the clock until they are gone,” said William Bottiggi, general manager of the Braintree Electric Light Department and a former NStar executive. And it also may have helped drag out efforts to restore power, critics say. Contract crews from Texas or Colorado not only have to drive out to Massachusetts, but they also lack the local knowledge that veteran local linemen have. Another issue critics point to is whether the big utility companies are doing enough to make the massive electric grids they control less vulnerable to outages. The utilities defend their record. Both National Grid and NStar, the state’s two largest utilities, contend they have significantly upped spending on tree trimming over the past decade—before this past year’s massive storms. But Rep. Winslow is skeptical of utility company claims that they have been on top of the tree -trimming situation, arguing they are under pressure to keep costs down. He also contends power companies across the state should heed the example of European countries which now have much greater power reliability by putting lines underground. Local utilities have argued against such proposals, citing their expense. “They would rather have angry customers who can’t go anywhere than angry investors who can throw them out of work,” he said. A 2010 state study also turned up evidence that the power lines run by the major utilities are older and less well maintained. The big power companies lose 4.6-to-5.2 percent of the electricity they pump through their lines, compared to 3.5 percent for town owned utilities, according to the report by the Massachusetts Department of Energy Resources. Experts like John Sterman, a professor at the MIT Sloan School of Management who studies failing infrastructure across the country, said what’s happening in New England reflects a national trend. He attributes the increasing number of outages across the U.S. to a downward spiral of maintenance budget cuts by power companies in a bid to bolster bottom lines, followed by more expensive outages and more cuts to make up the difference. “I believe the data clearly shows that the reliability of the North American grid has declined significantly over the past twenty-plus years,” Sterman said. Sticking it to the customer? As questions swirl about their performance during this past year’s storms, the state’s big utilities have yet to request permission from state regulators for any rate increases or surcharges. But the companies also make clear they eventually plan to recoup those costs, one way or another. NStar, which won approval a couple years ago for a $4 million a year storm fund, says it may rely on that to cover the costs of the two storms. That should help buffer customers from any impact, contends Michael Durand, a company spokesman. However, the funds themselves rely on ratepayer cash, not corporate reserves, with the company having won permission to raise rates to pay for the fund a few years ago. Based on NStar’s current storm cost estimates of $48 million, the company’s entire storm fund would be depleted each year for the next 12 years to cover those costs. There would be no money to cover future storms – and outages – that might occur. National Grid and Western Massachusetts Electric both said they will also be seeking permission to charge customers for the storm costs at some point in the future, but could not offer a timeline. And the potential charges couldn’t come at a worse time. Many homeowners and business owners are still helping pay off tens of millions in bills run up by their local utilities during the disastrous 2008 ice storm. “The companies are going to go to the regulators and ask for the money they spent on the storm from the ratepayers,” said Kenney, the utility union chief. “It’s big, big, big bucks,” he said. But utility regulators say they will have the final say on what storm costs the power companies can pass along to customers. Even the use of a pre-approved storm fund will likely have to be authorized. Still, the only case so far where a utility found its request to recover storm costs trimmed involves Unitil’s disastrous handling of the 2008 ice storm. One third of those costs were rejected, said Ann Berwick, chairman of the Department of Public Utilities. “In terms of ensuring excellent performance, it is our job to regulate these monopolies to be sure they provide excellent service and to penalize them if they do not,” Berwick said. Photo credits to Paul Bilodeau of the Eagle Tribune.